Your guide to exploring the northernmost prefecture of Honshu, Japan. From the cities to the wilderness, lakes, waterfalls and wonderful onsen. We share our top things to do in Aomori together with where to eat, play & stay in this practical travel guide. Located at the northern tip of Honshu, the largest island in Japan, Aomori prefectures is separated from Hokkaido by the Tsugaru Strait. To the east is the Pacific Ocean and to the west is the Sea of Japan. It’s hardly surprising then that this region has some of the freshest and most delicious seafood available. It’s also an idyllic spot to discover the natural beauty, culture and customs of northern Japan. We’ve always loved getting out of the big cities and discovering the sights, hiking trails and nature within the Japanese inaka or countryside. Aomori has plenty of opportunity for all of this and for our other great love in Japan, the food. Late summer and early autumn in Japan is when the fields turn to gold. The rice that has ripened through the summer is dried and golden in colour, ready for harvest. This is an essential time to the economy in rural Japan. 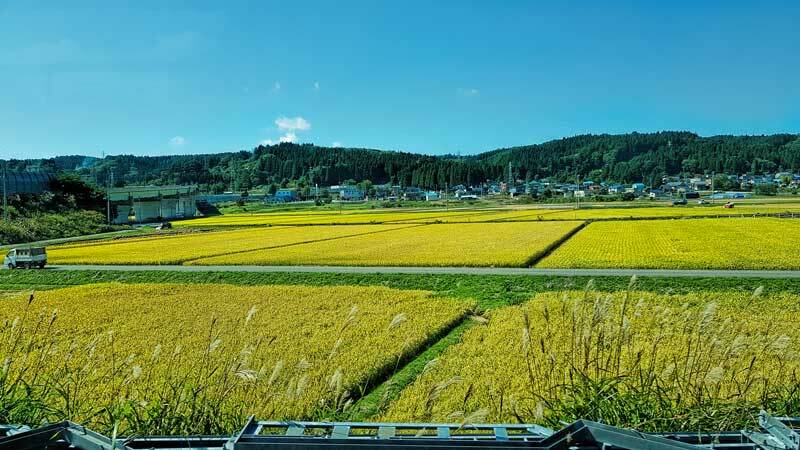 It’s also very beautiful whether you are passing the rice fields by train, on the road or have a little more time to take it slowly, cycling or walking along the quieter back lanes beside field after field of golden grains. Aomori City is located on Matsu Bay at the northern end of Honshu. I always prefer to explore new places on foot when I get the chance, it helps me to get my bearings in a new city and get a feel for its pace. 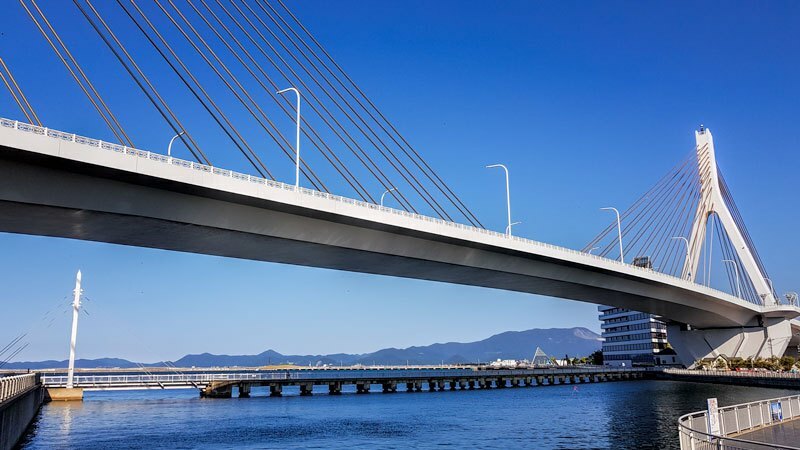 The Aomori bay area is perfect for that, it’s a relaxed space and a hub for tourism in the city. You’ll find Aoimui Park right on the water and the unique triangular architecture of the Tourist Centre behind that. If you have time head up to the observatory on the 13th floor for the views, I was told you can see as far as Hokkaido from here on a clear day. Along a little further and you’ll come to the Wa-Rasse Nubuta Museum and the A-Factory that both listed below. Then if you continue on under the Bay bridge there is a large yellow ship which is the Hakkoda Maru, a ship commissioned in 1964 to carry trains on the crossing from Aomori on Honshu to Hakodate in southern Hokkaido prior to the tunnel opening in 1988. It’s now permanently moored at the wharf here and houses exhibits that explain its use and history as well as providing a different view and perspective on the bay. My first seafood fix after arriving in Aomori was lunch at the restaurant that forms part of the Wa-Rasse Museum over-looking the bay. 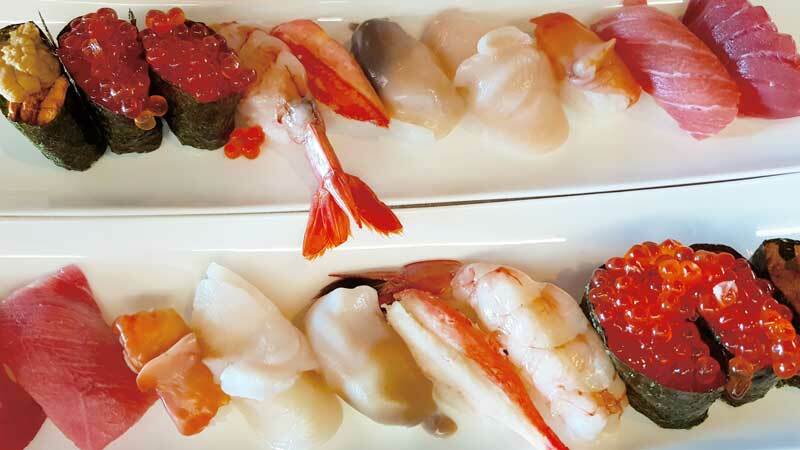 With so much sea surrounding Aomori and the local economy depending heavily on fishing, I wasn’t surprised to find the seafood and fish available was both diverse and of excellent quality. What better way to start my northern foodie adventures than with a platter of nigiri sushi. From creamy uni (sea urchin) to rich maguro (tuna), the salty ikura (salmon eggs) to silky ika (squid) and hotate (scallops) harvested right here in the bay, it was delicious and set me up for an afternoon exploring the city. 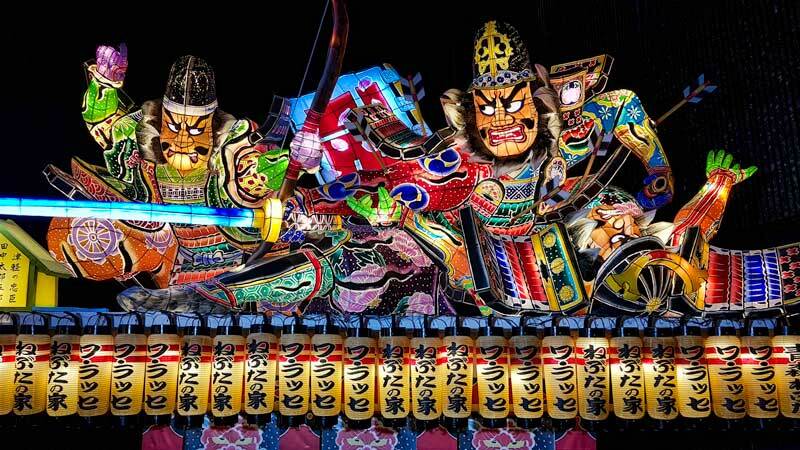 The Aomori Nebuta Matsuri is a summer festival that takes place during the first week of August each year. During the festival these elaborate giant lantern floats featuring characters from Japanese legend and history are paraded through the town. The floats are handmade each year and a competition will choose the best of the best although they were all very impressive. The floats are supported by substantial wooden frames for pulling them making them extremely heavy. Many hands are required to move them through the city streets and if you’re in town for the festival you can participate in helping to pull a float or simply join in to watch the spectacle, listen to the music and enjoy festival food. Although 3 million people now turn up to see the parade each year it’s not practical for everyone to be in town on the one week so Wa-Rasse has been established to enable visitors to enjoy the show all year through. 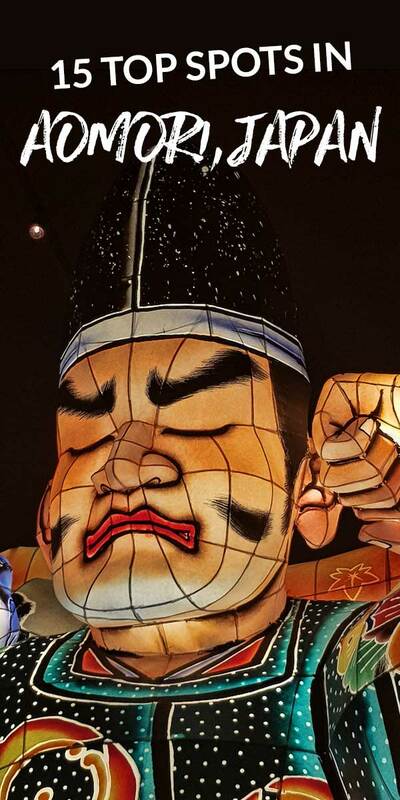 The floats from the previous years festival will be on display in the purpose-built warehouse that has been painted black with starlights to simulate the night sky as the Nebuta is an evening festival. In addition to seeing the floats, you can learn about the event and see how the lanterns are made. If you time your visit right you can also test out your rhythm with the festival dance or playing the taiko drums. Located adjacent to Aomori train station (not the shinkansen station) is the A-Factory, a tourism initiative of Japan Rail. The large facility is located right on the bay and brings together a duty-free market of fresh and packaged local produce, restaurants and a cider factory. While A-Factory features all types of local produce the Aomori apples have pride of place. The region is well known for its apple production supplying over half of Japans crop and 90% of the export market. There are up to 50 different varieties grown here with the internationally known Fuji being consistently popular and my personal favourite, the Japanese developed sweet and early fruiting Tsugaru. At the top of the stairs to the first floor you’ll find another restaurant and from here you can take the cider tour or purchase your stored value card to obtain tasters of the 10 different ciders in the bar area from the purpose-built vending machine. You can purchase your samples in 3 different sized serves from the 10 ciders on display. I’d have said that I like my cider on the dry side but I took the opportunity to test out a few of the sweet fruity blends that were especially good in the early afternoon. Ringo Bako translates to apple box in English and you can immediately see how this pub style restaurant got its name. The structure of the tables and seating are made up of dozens of stacked apple boxes which are fortunately surprisingly comfortable as you will want to stay a while. Make sure you are settled in for dinner by 7 pm when a local shamisen player will perform on stage. Having previously viewed this traditional instrument as producing somewhat sombre music I was surprised at the passion and lively notes that were drawn from the strings by the woman in front of me. 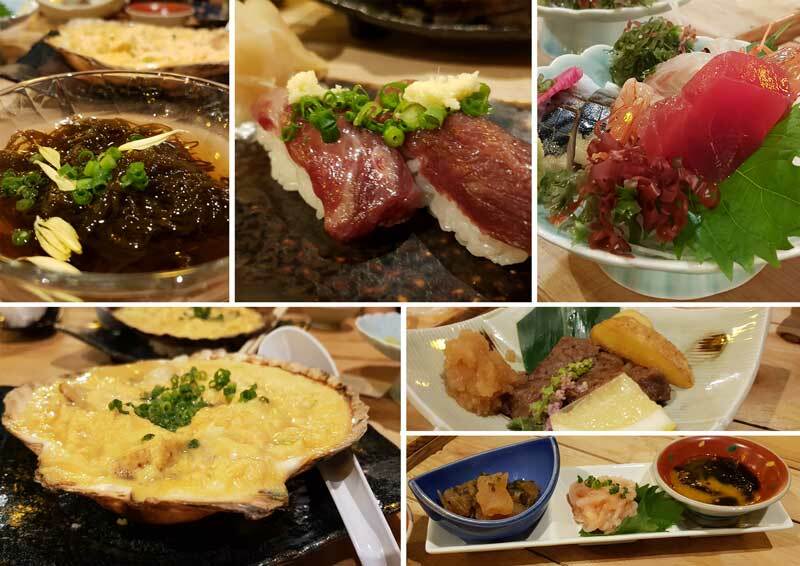 It wouldn’t be the only surprise of the night, Ringo Bako’s specialty is local dishes from the area and our multi-course kaiseki style meal included several dishes that were new to me including raw horse sashimi. 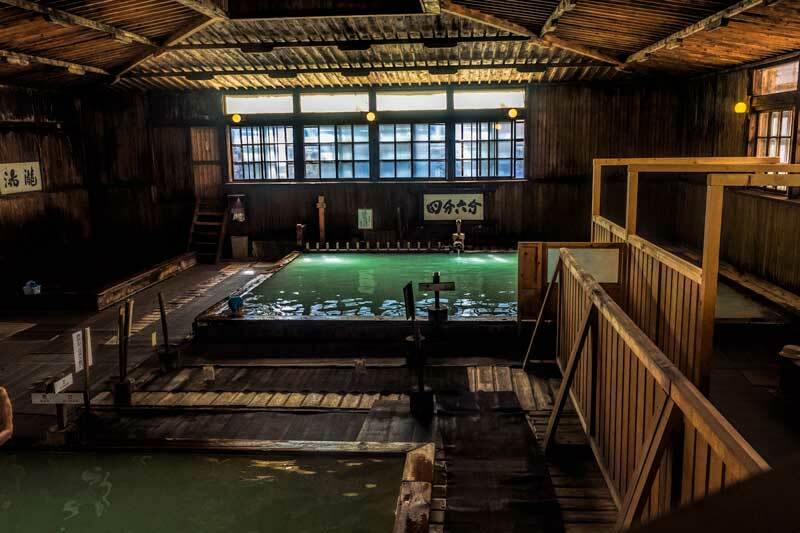 There’s 300 years of history preserved in Sukayu Onsen, the oldest thermal bathhouse in Aomori. It’s renowned for its healing alkaline waters and for its oversized sen-nin-buro, literally 1000 person bath. It’s one of less than 500 konyoku still operating in Japan since mixed bathing began to disappear during the Meiji era and legislation now means that new ones are unable to open. As you’ll see in the photo above 1000 people is an optimistic estimate or at least a more intimate experience than I like my onsen to be. As with all onsen in Japan, swimsuits aren’t worn but men and women are expected to stay on their own side of the pool and the screen provides some privacy to female bathers entering the water. There’s also a smaller women-only bath in another section of the facility. I did learn later that there’s a heavy fabric garment something like a short apron that can be purchased by women and worn at this particular onsen although I didn’t see it used and I would suspect that it would detract from the relaxing onsen experience for many bathers. Sukayu is located in the hills near ski facilities and popular hiking trails. After an energetic day on the powder slope or hiking in the hills the muscle rejuvenation and relaxation would be very welcome. Japan focuses on and celebrates all its seasons. Up here in the north of Japan winters are cold and produce a deep layer of snow, perfect if you like to ski but the shoulder seasons of spring and summer are to me the best time of the year. We were lucky enough to be treated to a bit of early colour in late September, a bit too early really to expect a good show but an indication of just how spectacular these hillsides will be in another few weeks time. Lake Towada is the largest caldera lake on the Japanese island of Honshu. 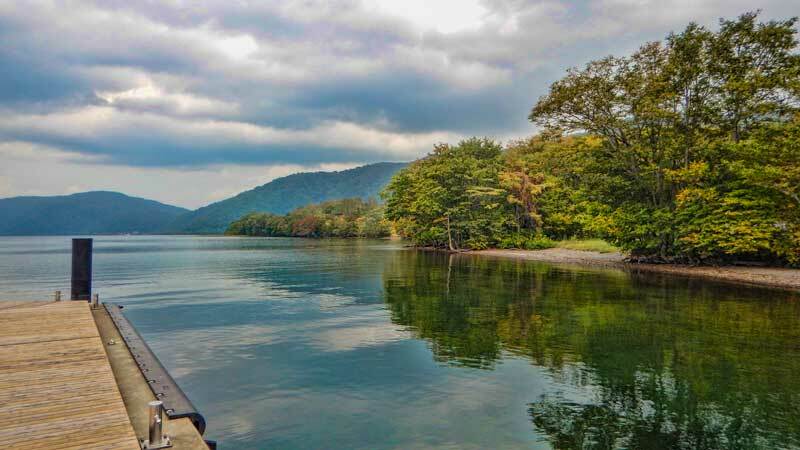 The lake is situated on the southern border of Aomori Prefecture above Akita and surrounded by National Park forest creating a dramatic landscape with many opportunities for hiking, boat trips and in the season, autumn colour. 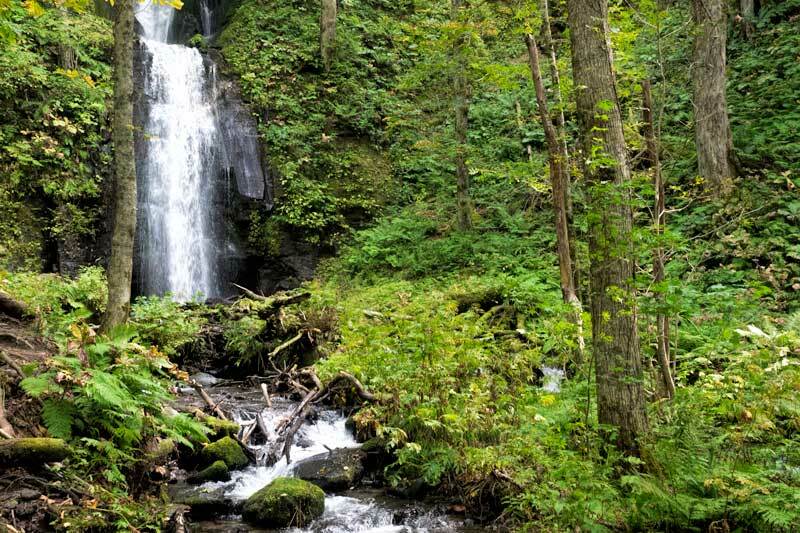 From the southern shore there are two peninsulas that jut out into the lake, the township, Towada Shrine and the well-known maiden statue are located on the western peninsula which is a good place to explore. Given the thermal activity nearby and the proliferation of onsen I shouldn’t have been surprised to learn that the caldera is still an active volcano, its current form the result of an eruption 5,400 years ago. While it’s Japans 12th largest lake it’s most striking feature is the brilliant turquoise blue colour it takes on as a result of its depth, which in parts is over 300 metres deep. To really see the best of its colour you need to get out on the water. Lake Towada feeds out to the Pacific Ocean along the Oirase River. The creek begins at the lakes central eastern shore and for around 14 km follows a gentle meandering route scattered with picturesque waterfalls and cascades through the National Park. This hiking trail is one I hope to return to soon with a few days to spare to really enjoy the nature around here. If you’re able to time your visit for the autumn leaves it’s widely agreed to be one of the most picturesque spots for it in Japan. The hiking path roughly follows the road which is at a similar elevation to the creek so it’s not a remote hike and mostly flat making at least sections of it accessible to most people. There is Japan Rail bus stops all the way along the road so you can start and stop your walk at many different points. 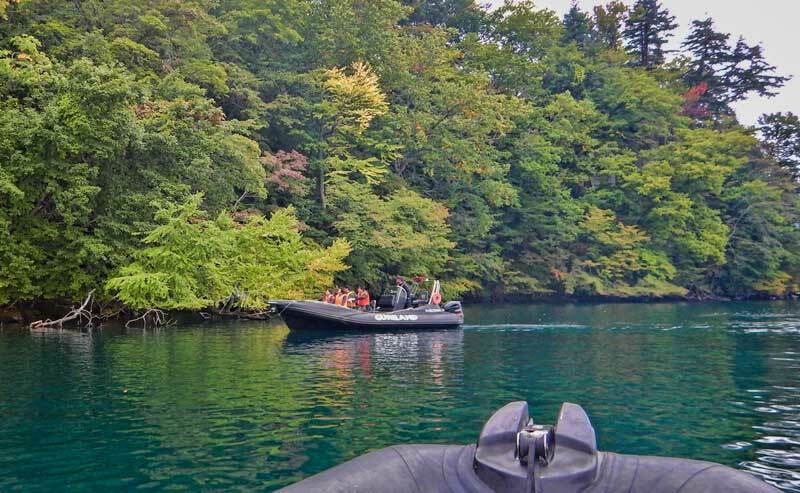 There’s a more sedate boat trip option to see Lake Towada in the Towada-Hachimantai National Park but why take the slow boat when there’s a thrilling RIB ride option. A RIB is a Rigid-hull Inflatable Boat, they’re a style of boat favoured by the military for their speed and manoeuvrability. As I fastened my camoflage patterned waterproof poncho in place over my clothes I did wonder if this was perhaps not the best idea on a cool autumn afternoon with nothing handy to change into. As I wobbled on the inflated side of the boat wondering if I’d land inside the boat as I intended or with an ungainly flop into the cold water I questioned my choices a second time. A few moments later as we sped off into the distance, with a huge grin on my face, there was no doubt it was the perfect way to see the lake. Guriland is located on the southern shores of Lake Towada in the bay created between the eastern peninsula and shoreline. The crater lake is large at 61 km² so the RIB enables you to get around the points of interest fast and have some fun along the way. The guides are skilled and professional in contolling the boat but they do like to have some fun with their guests, using the two boats they create a whirlpool as they whizzed around in a small circle creating some decent waves. The boats are also relatively small and easily handled allowing them to be taken up narrow channels at the side of the lake and get in close to the edge. Many will recall the footage from Hachinohe following the Tohoku earthquake and tsunami in 2011. Huge fishing vessels were washed ashore amid devastating tales of loss and destruction. It was made even more real to me the day before our visit to Hachinohe as I awoke at 5.22am to find my hotel room being rocked by a 5.8 magnitude earthquake. The noise and motion on the 9th floor wasn’t insignificant but it was nothing of note to those who’d experienced the 9.0 magnitude quake and its aftermath. As we drove through Hachinohe it had been 6.5 years since the Great Tohoku Earthquake and the port and daily life has returned to normal. A young man from Hachinohe is travelling with us, in 2011 he would have only been in his early teens and he tells us his memories of that day and those that followed. He speaks without emotion as is the Japanese way but it’s impossible not to feel an empathy and respect for what has been overcome. If you’re a fan of sake or simply want to understand it a bit more after a few days of passing through the extensive rice fields of Aomori then the Hachinohe Sake Brewery has a shop and tasting that’s open to the public. Established in 1776 the current brick factory was built in the 1920’s with bricks and trade skill imported from Scotland. 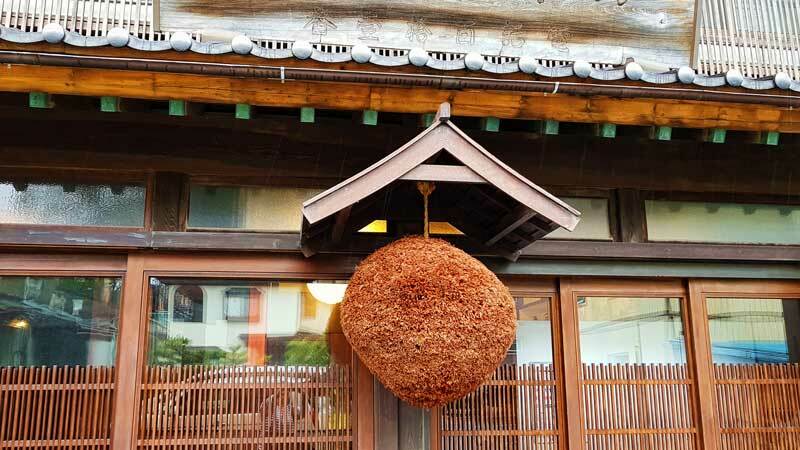 While you can’t tour the factory itself you can try a variety of their sakes inside the adjacent wooden building marked by the well-recognised sugidama or cedar ball hanging outside. 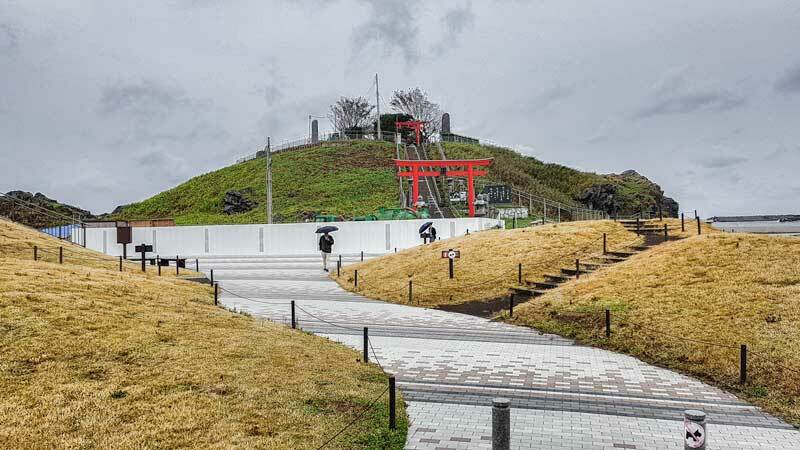 Located right on the port of Hachinohe it was a blessing that Kabushima Shinto Shrine, sitting atop the small knoll on the harbour wasn’t washed away in the tidal wave following the great Tohoku earthquake. The shrine was established in 1269 to honour the black tailed gulls that nest nearby but was sadly burned down in late 2015. It wasn’t the first time that fire had destroyed Kabushima, it was ravaged previously in 1780 and rebuilt the following year, from the look of the construction walls preventing access to the torii and stairs it will soon rise again. 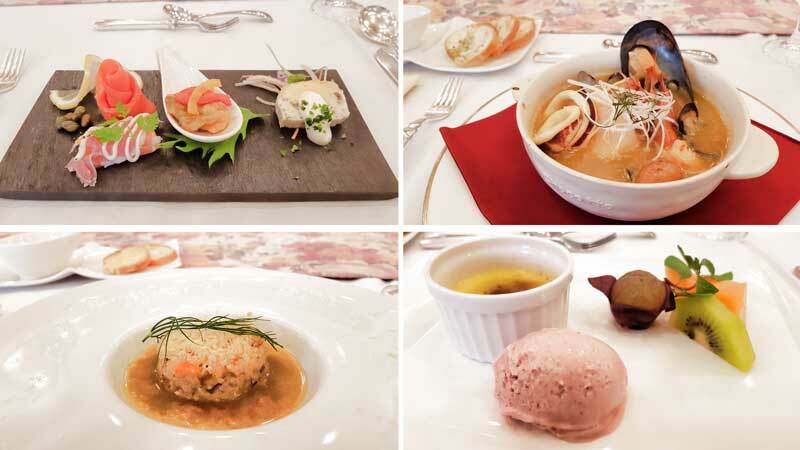 The Bouillabaisse festa takes place between the 1st February and the 31st March each year in Hachinohe although I was fortunate enough to enjoy the full experience of the 2017 dish at the Hachinohe Park Hotel restaurant out of season. Bouillabaisse is a French-styled seafood soup that is given a local twist for the 2 month period of the festival. Hachinohe is a fishing port on the Northern Pacific Ocean and boats returning to this port bring a diverse catch of fish and seafood. 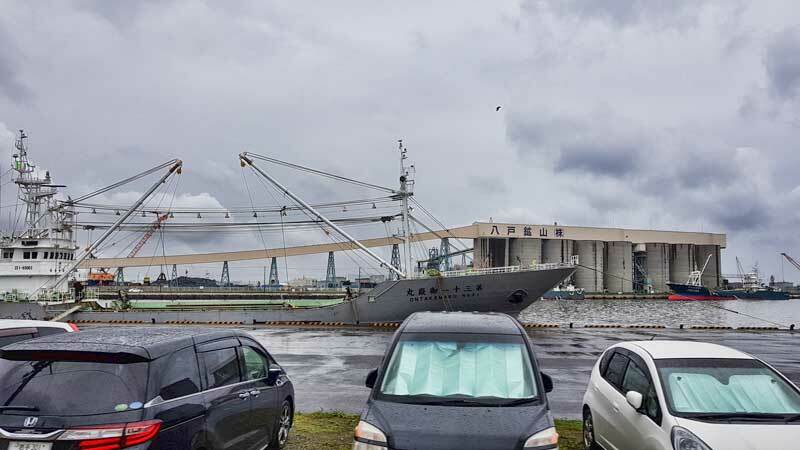 The first rule of the competition is that the Bouillabaisse must contain at least 4 types of fish and seafood landed in the Hachinohe port. The second rule is that it must be served two ways, first as the traditional broth based soup with seafood and then as part of another dish. The way it was served at the Park Hotel was with the Japanese Mitten Crab soup broth surrounding a mound of seafood rissoto with a crispy and slightly chewy crust. Delicious. There were 17 restaurants participating in 2017 and based on the standard of seafood and presentation it would be high on my list to try a few of the others if I was travelling in Aomori in the winter season. Within the Aomori city and other cities in the prefecture accommodation is largely targeted at business travellers. Unless you are visiting Aomori City for the Nubata Festival in the first week of August accommodation should generally not be difficult to come by. On this visit I stayed at the Hoshino Resorts Oirase Keiryu Hotel which was clean and offered larger than average rooms for the price, the view out to the bay was good and the Japanese breakfast included with the room was excellent. 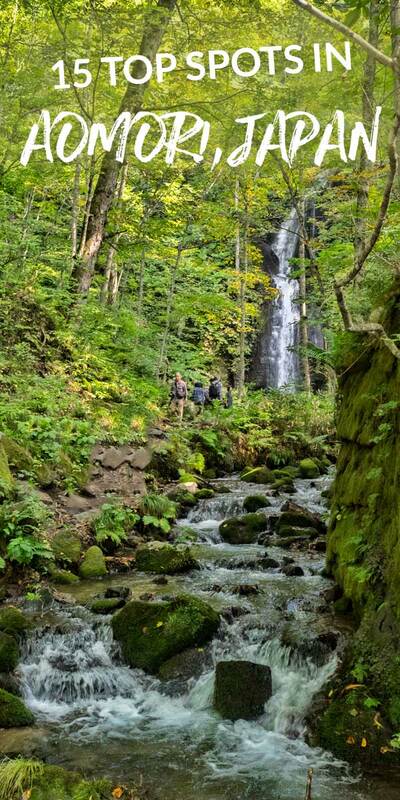 A big attraction of Aomori Prefecture is Lake Towada and the Oirase Gorge area. If you enjoy nature I’d suggest at least a night based here and it’s somewhere we plan to get back to together next time to fully enjoy the walking trails and the onsen facilities. There are a few hotels in the area but I stayed at the Hoshino Resorts Oirase Keiryu Hotel, although English was limited in the resort everyone was very helpful and friendly and we got by with no issues. 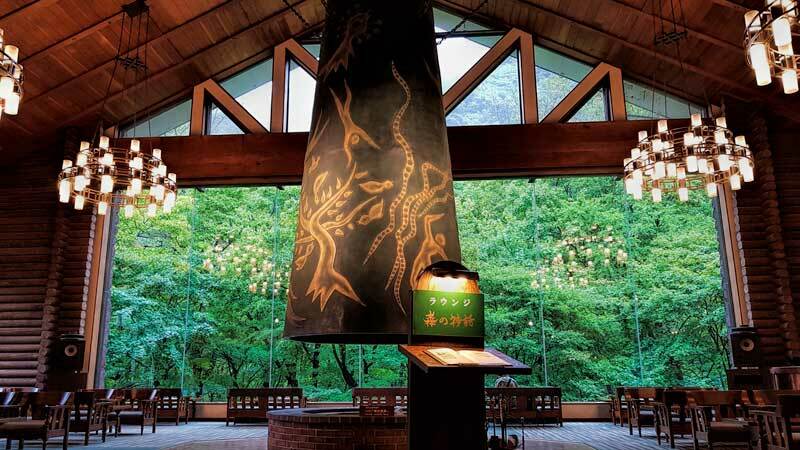 The rooms are gorgeous but the big attraction for me here is the 14 km, 14 waterfall, walking path from the hotel through to Lake Towada. The JR bus stops at the hotel, lake and a number of stops in between so you can get the bus back at the end or adjust the length of the walk if you need to. To warm up or pamper yourself afterwards the hotel has an onsen on the property and also runs a bus (approx 5-minute trip) to another onsen with a waterfall outlook. Most visitors arrive in Aomori either through Aomori Airport or Shin-Aomori, the Shinkansen Station. You can fly to Aomori from most major airports around Japan. If you’re going to fly domestically in Japan it’s worth knowing that both JAL (Japan Airlines) and ANA (All Nippon Airlines) have a Y10800 flight deal in place to any airport in the country. For some routes such as Tokyo to Aomori with JAL it can be as little as Y5400. While we’re big fans of the train we have used these discount air tickets on occasion including our Sapporo Snow Festival trip. If you plan to fly it’s worth getting in as soon as the discount flight booking period opens especially if it’s for a popular event as we did or at a busy travel time. The bullet train or shinkansen now runs all the way past Shin-Aomori to Hakodate in Hokkaido and offers a very comfortable mode of travel plus you can stop off and explore different towns along the way. If you’re travelling through to the northern island of Hokkaido or looking to make use of your Japan Rail Pass to explore another region of Japan then Aomori is a convenient stop on the Tohoku Line running north from Tokyo. From Tokyo take the direct JR East Hayabusa shinkansen and the trip will take around 3 hours. If you plan on travelling within the Tohoku region by train the JR East Pass (Tohoku Region) might be worth a look. Unlike the standard JR Pass this is for a specific region but allows you to travel on any 5 days in a 14-day window so may provide some extra flexibility at a more affordable price depending on your plans. If you found the article helpful please save to Pinterest or share on social media using the buttons below. Thank you! Please feel free to ask any questions, we’ll do our best to answer. If you have an experience or special place to visit from the Tohoku Region we’d also love to hear about it in the comments below. We are a group of four arriving at the Port of Aomori by cruise ship on April 24, 2019. We are specifically interested in visiting the Hirosaki Castle – it should be quite beautiful with cherry blossom. Unfortunately, I am having trouble locating a tour or transportation. I know there is a combination of bus and train service that we could do independently; however, we are a senior citizen group, and I believe the public transportation involves quite a lot of walking. I don’t think that is going to work for us. Hi Jeanette, your timing should be perfect for the blossoms. I think there are a couple of options that might work for your group. From the cruise port to the JR station in Aomori is a short walk but it might take 20 minutes or so, the waterfront is nice to see but perhaps grab a taxi if that suits better to save your legs for exploring later as you’ll walk a bit at the castle and gardens. Then take the train to Hirosaki which takes 35-50 minutes depending on whether it’s a local train or limited express. Outside the station there are taxi’s, it’s about 2.5 km to the castle and the taxi will only take a few minutes, in Japan you pay what’s on the meter don’t barter a price but they are very honest. A cheaper option is the loop bus that also runs from the station which will take about 15 minutes. A second option which we haven’t used from there is a taxi, while they aren’t large in Japan you won’t have luggage and 4 people will fit. It’s around 45 km and takes just over an hour. You can get one near the port or there are taxi tours like this one that you can book ahead and split the cost across your group. We’re Aussies going to be on a cruise ship that berths in Aomori on April 30. There are 6 of us and we’re looking to hire a local guide to show us around for a few hours. Your website shows many interesting places to visit. Others have said that there’s nothing much to see here. So I was wondering if you know anyone who could take the 6 of us around to show us the sights. The cruise terminal is a short walk to the city centre and attractions but I suppose like most regional cities there is a limited amount to see and depending on your interests I would suggest getting out of the city centre, perhaps to see the beautiful scenery around Lake Towada if you had the time or visit an onsen town. The seafood in Aomori is fabulous too. I don’t have a contact for a local English speaking guide but have you found this site which has a map of the walkable city sights? For something different Asamushi Onsen is only about 20 minutes away by train and even if you don’t fancy Japanese hot spring bathing the area has more to see. Your timing should also have you there for cherry blossoms which are late April to mid-May in Aomori and worth looking out for. The split second I saw the Hachinohe image I knew it was located where the tsunami hit, for the countless YouTube videos I watched of the wave slamming into town. I saw the boat, the background, and everything clicked. Happy to see the place is on its feet again after that natural disaster. Cycling or walking through the golden colored rice fields would be high on my list, as I do this frequently in places through SE Asia. May as well do it in Japan too. What a peaceful, serene afternoon, chilling amid the rice fields. Thanks for the fab post Toni.